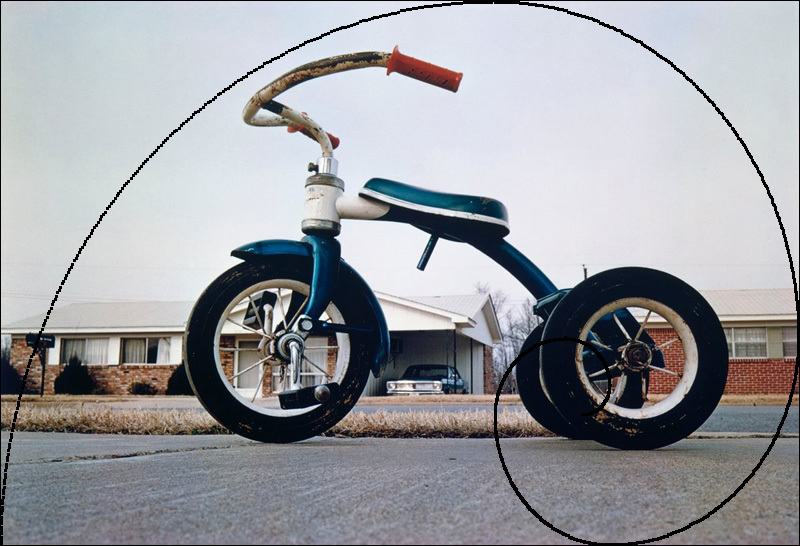 Photo used in illustration by William Eggleston. In a previous post, I said something to the effect that the NYT did not do serious photography criticism. Now I come across this great piece on Steve McCurry by Teju Cole, which argues that the immensely popular McCurry is a hack (I have no position on this, just relating what Cole says). That is just one article in Cole’s monthly On Photography column for the New York Times Magazine. Unfortunately, it’s the only one that offers a negative take on a body of work, and it’s kind of piling on poor McCurry who was getting it rough from much of Photo World at the time over some lame Photoshopping. golden ratio (two quantities are said to be in a golden ratio if the ratio of the larger to the smaller is the same as the ratio of their sum to the larger). Imagine a triptych in which the center is about 0.618 as wide as each of the wings. Because this ratio is often found in nature, it is credited as the mathematical logic behind many efficient and visually pleasing phenomena: certain flower petals, or mollusk shells, or spiral galaxies. These codes can be helpful for looking. But the reality is that there is usually a much more improvisatory and flexible mathematical order at play in a successful photograph. Yes, that is very well-said. Each great photograph is an original solution to a unique set of circumstances. On the other hand, I’ve spent a lot of time overlaying the golden ratio on great photographs, and it’s quite often a perfect fit. There are infinite ways to be discomfiting within a classic composition. Anyway, seeing Teju Cole’s byline on that article seems one of those weird cosmic convergences as I’ve been half paying attention to David Alan Harvey’s collaboration with him on an upcoming article for the NYT mag. A great writer and a great photographer collaborating on an important story. Can’t wait to see what they come up with.